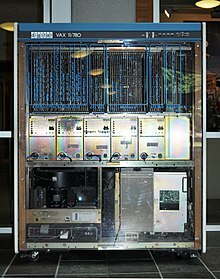 The name "VAX" originated as an acronym for virtual address extension, both because the VAX was seen as a 32-bit extension of the older 16-bit PDP-11 and because it was (after Prime Computer) an early adopter of virtual memory to manage this larger address space. Early versions of the VAX processor implement a "compatibility mode" that emulates many of the PDP-11's instructions, and are in fact called VAX-11 to highlight this compatibility and that VAX-11 was an outgrowth of the PDP-11 family. Later versions offloaded the compatibility mode and some of the less used CISC instructions to emulation in the operating system software. The VAX went through many different implementations. 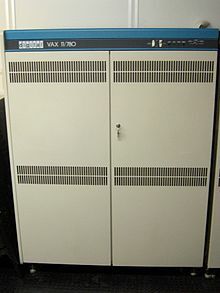 The original VAX 11/780 was implemented in TTL and filled a four-by-five-foot cabinet with a single CPU. CPU implementations that consisted of multiple ECL gate array or macrocell array chips included the VAX 8600 and 8800 superminis and finally the VAX 9000 mainframe class machines. CPU implementations that consisted of multiple MOSFET custom chips included the 8100 and 8200 class machines. The VAX 11-730 and 725 low-end machines were built using bit-slice components. Cancelled systems include the "BVAX", a high-end ECL-based VAX, and two other ECL-based VAX models: "Argonaut" and "Raven". Raven was cancelled in 1990. A VAX known as "Gemini" was also cancelled, which was a fall-back in case the LSI-based Scorpio failed. It never shipped. The East German VEB Robotron K 1840 (SM 1710) is a clone of the VAX-11/780 and Robotron K 1820 (SM 1720) is a copy of the MicroVAX II. The SM-1700 is a Soviet clone of the VAX-11/730, SM-1702 was a clone of MicroVAX II and SM-1705 was a clone of VAX-11/785. The NCI-2780 Super-mini, also sold as Taiji-2780, is a clone of the VAX-11/780 developed by North China Institute of Computing Technology in Beijing. ^ Payne, Mary; Bhandarkar, Dileep (1980). "VAX floating point: a solid foundation for numerical computation". SIGARCH Comput. Archit. News. ACM. 8 (4): pp 22–33. doi:10.1145/641845.641849. ISSN 0163-5964. ^ a b Levy, Henry; Eckhouse, Richard (2014-06-28). Computer Programming and Architecture: The Vax. Digital Press. ISBN 9781483299372. ^ "VAX MACRO and Instruction Set Reference Manual". www.itec.suny.edu. Retrieved 2016-06-19. ^ Clinton F. Goss (August 2013) [First published June 1986]. "Machine Code Optimization — Improving Executable Object Code" (PDF) (Ph.D. dissertation). Computer Science Department Technical Report #246. Courant Institute, New York University. arXiv:1308.4815. Bibcode:2013arXiv1308.4815G. Retrieved 22 Aug 2013. Lay summary. ^ a b Rainville, Jim; Howard, Karen, eds. (1997). "VAX/VMS at 20". Digital Equipment Corporation. Retrieved 2018-07-20. ^ "Porting Linux to the VAX". ^ "OpenBSD 6.0". 2016. Retrieved 2017-06-20. ^ "VAX 11/780, The First VAX System (October 1977)". ^ Slater, Robert (1987). Portraits in Silicon. MIT Press. p. 213. ISBN 978-0-262-69131-4. ^ "VAX 11/780 Computer – CPU". Computer History Museum. Retrieved 2012-10-24. ^ "VAX Systems: A letter from Jesse Lipcon". Archived from the original on 2000-08-15. ^ "If It Ain't Broke, Don't Fix It: Ancient Computers in Use Today". PCWorld. Retrieved 2016-06-19. ^ "VAX MACRO and Instruction Set Reference Manual". OpenVMS documentation. April 2001. ^ VAX Architecture & Assembly Reference (PDF). Department of Computer Science, Rochester Institute of Technology. Retrieved 2012-09-14. ^ Mark Smotherman (2008-07-19). "Who are the Computer Architects?". Retrieved 2008-09-30. ^ Supnik, Bob (2007). "Raven". Retrieved 1 March 2019. ^ "RAL Informatics Report 1984-85". Retrieved 2007-10-15. ^ "The TPA story". Retrieved 2007-10-15. ^ Dujnic, J.; Fristacky, N.; Molnar, L.; Plander, I.; Rovan, B. (1999). "On the history of computer science, computer engineering, and computer technology development in Slovakia". IEEE Annals of the History of Computing. 21 (3): 38–48. doi:10.1109/85.778981. ^ Laimutis Telksnys; Antanas Zilinskas (July 1999). "Computers in Lithuania" (PDF). IEEE Annals of the History of Computing. 21 (3): 31–37. doi:10.1109/85.778980. ^ U.S. Congress, Office of Technology Assessment (July 1987). Technology transfer to China. U.S. Government Printing Office. p. 96. OTA-USC-340. ^ Xia Nanyin; Chan Laixing. "Satellite Launch and TT&C Systems of China and Their Roles in International Cooperation". In F. Sharokhi; J. S. Greenberg; T. Al-Saud (eds.). Space Commercialization: Launch Vehicles and Programs. American Institute of Aeronautics and Astronautics. p. 244. ISBN 0-930403-75-4.